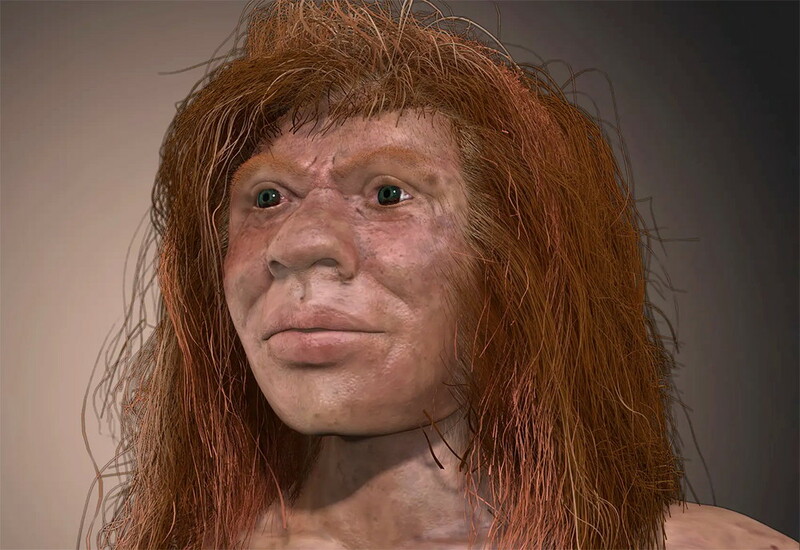 An artist’s impression of the teenage 'Denny', the ancient mixed heritage Denisovan mystery girl, who lived 90 000 years ago, and who had a Neanderthal mother and a Denisovan father. The Denisovans or Denisova hominins are an extinct species or subspecies of archaic humans in the genus Homo. Pending its status as either species or subspecies, it currently carries the temporary names Homo sapiens [subspecies] denisova. 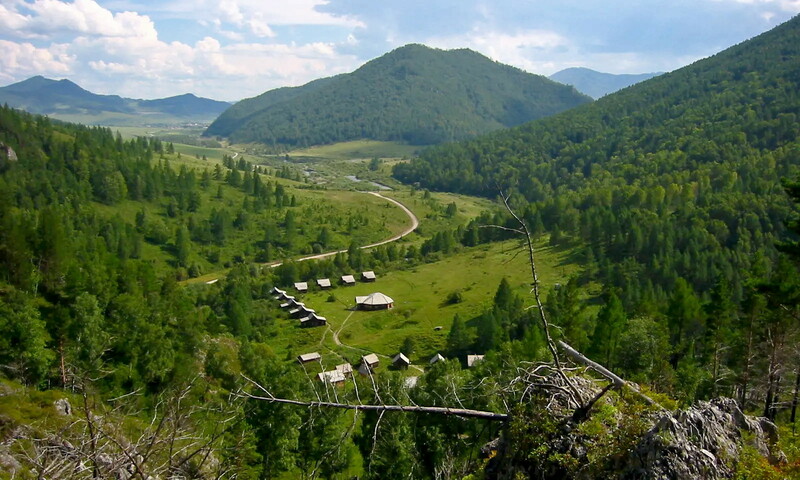 In March 2010, scientists announced the discovery of a finger bone fragment of a juvenile female who lived about 41 000 years ago, found in the Denisova Cave in the Altai Mountains in Siberia, a cave that has also been inhabited by Neanderthals and modern humans. The mitochondrial DNA (mtDNA) of the finger bone showed it to be genetically distinct from Neanderthals and modern humans. The nuclear genome from this specimen suggested that Denisovans shared a common origin with Neanderthals, that they ranged from Siberia to Southeast Asia, and that they lived among and interbred with the ancestors of some modern humans, with about 3% to 5% of the DNA of Melanesians and Aboriginal Australians and around 6% in Papuans deriving from Denisovans. A 2013 comparison with the genome of another Neanderthal from the Denisova cave revealed local interbreeding with local Neanderthal DNA representing 17% of the Denisovan genome, and evidence of interbreeding with an as yet unidentified ancient human lineage. Analysis of DNA from two teeth found in layers different from the finger bone revealed an unexpected degree of mtDNA divergence among Denisovans. 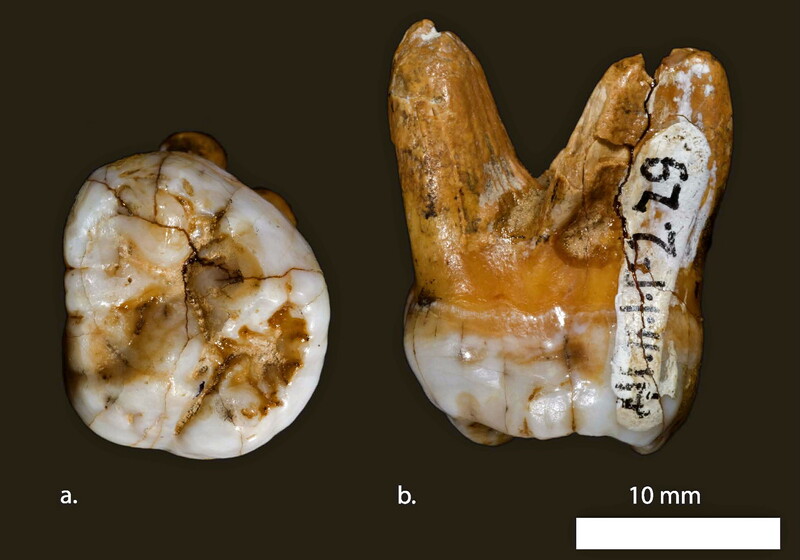 Two teeth belonging to different members of the Denisova cave population have been reported. In November 2015, a tooth fossil containing DNA was reported to have been found and studied. In the 18th century, the cave was inhabited by a hermit, Dionisij (Denis), and was named after him, while the indigenous Altay people call it Ayu-Tash (Bear Rock). In the 1970s, Soviet scientists discovered palaeoarcheological remains in the cave that led to further explorations. So far, 22 strata have been identified, with archaeological artefacts that cover the time from Dionisij back to about 125 000 – 180 000 years ago. 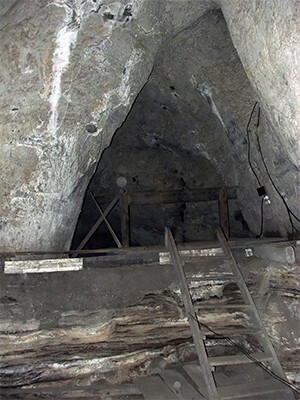 The dating of the strata was accomplished by the use of thermoluminescence dating of sediments, or, in some cases, radiocarbon dating on charcoal. Among the archeological artifacts are Mousterian- and Levallois-style tools attributed to Neanderthals. Beside tools, researchers found decorative objects of bone, mammoth tusk, animal teeth, ostrich egg shell, fragments of a stone bracelet made of drilled, worked, and polished dark green chloritolite, and pendants. A 7 cm (2.8 in) sewing needle made from bird bone, estimated to be around 50 000 years-old, was found in Denisova Cave. 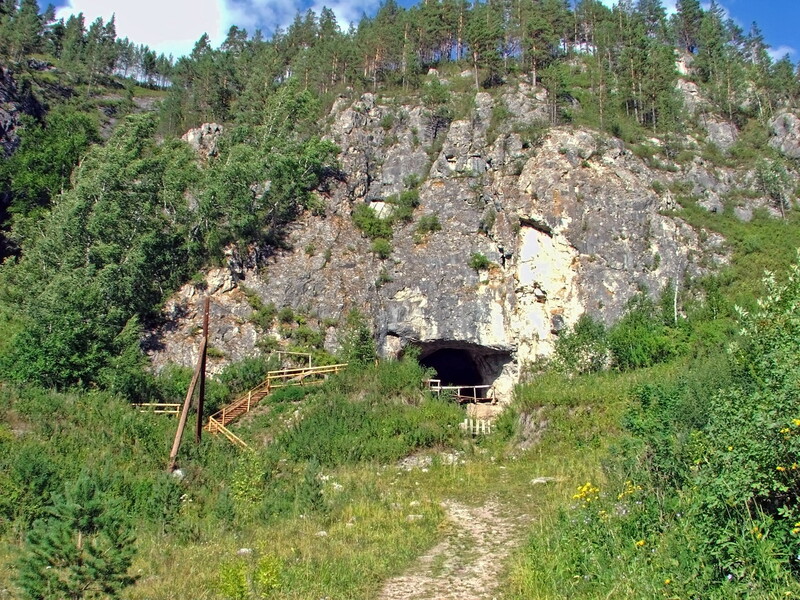 The cave also contains stone tools and bone artefacts made by modern humans, and Pääbo commented: "The one place where we are sure all three human forms have lived at one time or another is here in Denisova Cave." Until recently, scientists relied on what genetic information they could glean from a single Denisovan tooth and finger bone discovered in 2008. But after a second tooth was recently uncovered and analyzed, everything they knew about our ancient cousins changed. 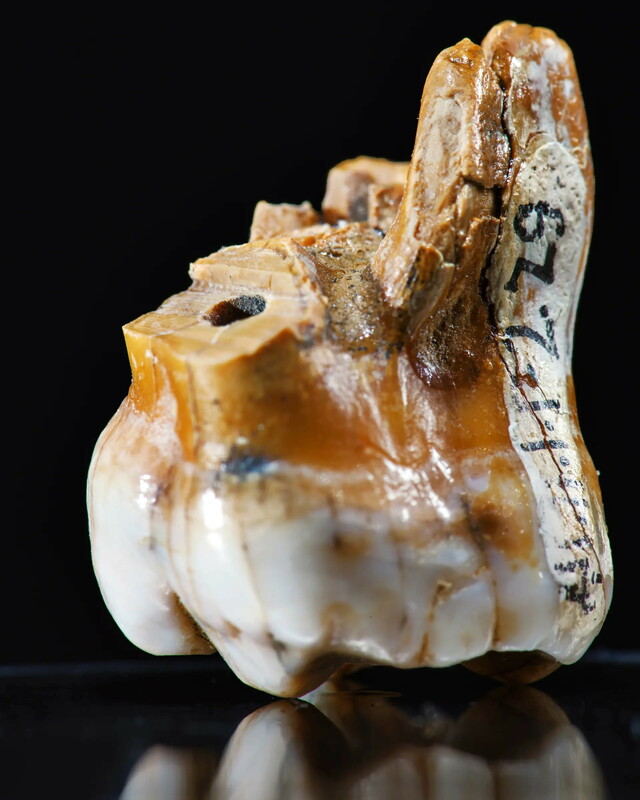 The new tooth, called 'Denisova 8' appears to be at least 110,000 years old, roughly 60,000 years older than the other two specimens. The Denisovans were more closely related to Neandethals, having diverged from Homo sapiens about 500,000 years ago. Yet genetic scans suggest that Denisovans interbred with both Neanderthals and Homo sapiens, as well as possibly a fourth unknown species, Sarah Kaplan writes for The Washington Post. 'We aim to find out where they lived, when they came into contact with modern humans – and why they went extinct,' says project leader Katerina Douka, of the Max Planck Institute in Jena, Germany and a visitor at Oxford University. 'It is a wonderful site,' says Tom Higham, deputy director of Oxford University’s Radiocarbon Accelerator Unit and an adviser to Finder. 'It is cool inside, so DNA in bones does not disintegrate too badly. However, nearly all the bones there have been chewed up by hyenas and other carnivores.' 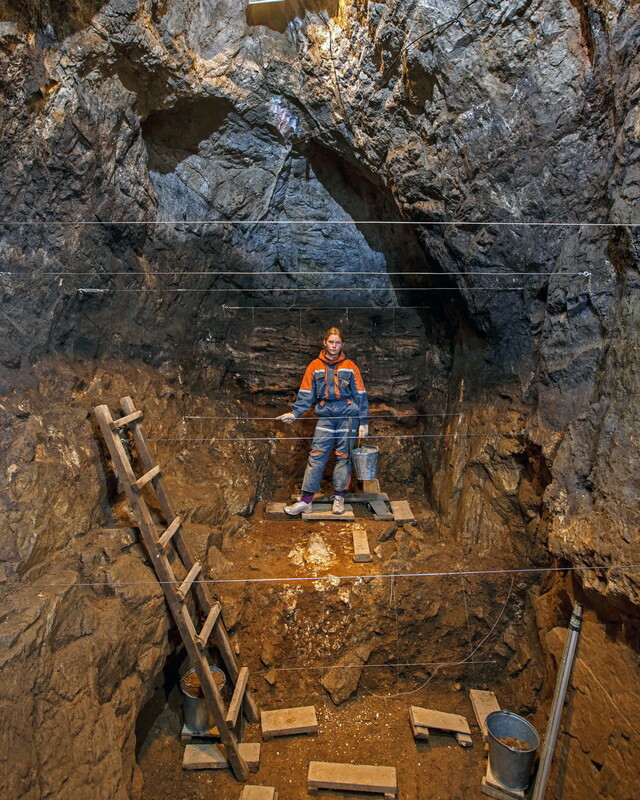 As a result, Denisova’s cave floor is littered with tiny, unidentifiable bone fragments. A molar tooth found at Denisova Cave. 'We asked Anatoly Derevyanko and Mikhail Shunkov, who direct the cave’s excavations, for samples – and they gave us a big bag full of bits of bones. All the fragments were considered to be unidentifiable,' says Douka. Site of the Denisova Cave in Altai Mountains of southern Siberia. The team began to prepare the bones. A 20mg slice was cut from each and placed in a test tube and given an identification code. After three months, 150 samples had been prepared. 'That was nowhere near enough,' says Higham. At that point, Brown could have left the project with honour. But she chose to go on. 'Thank God she did,' says Higham. A further 1,500 Denisova bone samples were prepared by her and then taken to Manchester. This time, the results were spectacularly different. One bone, number 1,227, was identified as being from a human species. Interior of Denisova Cave in 2008. Then the Leipzig team – led by Pääbo’s student Viviane Slon – began more detailed genetic analysis and made a startling discovery. Exactly half the sample consisted of Neanderthal DNA. The other half was made up of Denisovan DNA. At first, the researchers assumed that the sample was contaminated. 'I thought they must have screwed up something,' says Pääbo. But re-testing confirmed the finding: the Oxford team had discovered the 90,000-year-old remains of a hybrid daughter of a Neanderthal mother and a Denisovan father. She was nicknamed Denny. 'If you had asked me beforehand, I would have said we will never find this, it is like finding a needle in a haystack,' Pääbo told Nature. Excavation at Denisova Cave. Facebook Twitter Pinterest Excavation at Denisova Cave. Photograph: Robert Clark It is an intriguing picture, though much more information is required to confirm it. Scientists have no direct evidence that the Denisovans’ homeland range was primarily to the east of the cave, although the fact that their genes have been detected in the DNA of populations in Australia, New Guinea and other parts of Oceania, provides support for this idea and suggests future searches for sites should be focused on eastern Russia, China and south-east Asia. A great deal more needs to be learned about the Denisovans, says Higham: 'What was their distribution? What is the earliest evidence for their emergence from the common ancestor they shared with Neanderthals 500,000 years ago? If we could get a bone or two from other sites, that would be tremendously helpful.' One possible source of fossils could include remains of ancient humans that were placed in museums in Asia decades ago. These could be wrongly labelled, and could be Denisovans, researchers suggest. Unfortunately, it has proved difficult to get hold of these specimens for sampling.